Bill Murray, aside from being famously funny, also famously doesn’t have a publicist or a manager, or really even an agent to handle his calls. Instead, Murray has a toll-free telephone number. Call him. Make him an offer. If he doesn’t refuse it, he’ll call you back. Maybe even work with you on your film, or whatever. Malkoff has made a name for himself by testing his own personal limitations as well as those of society, and capturing it on video. Exhibits A-Z: Previous Mark Malkoff video webseries. 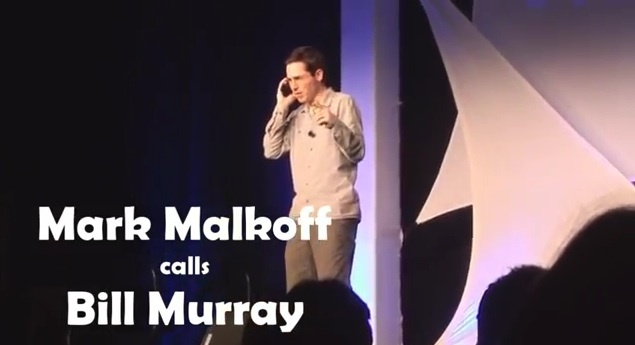 For his next trick, Malkoff has launched The Bill Murray Show Starring Mark Malkoff. The “show” essentially stars Murray as a dinner guest of Malkoff’s in his apartment in Queens, “performing” for a live audience of one: Malkoff’s wife, Christine Peel-Malkoff. until Murray, in fact, shows up. “I’ve always wanted to have Bill Murray over to my apartment for dinner, and I think he’d be a fantastic house guest. I hope he enjoys sushi and Wii bowling,” Malkoff said. In the episodes without Murray, Malkoff will interview celebrity guests, fans of Bill Murray and others who have interacted with Murray. He’ll also encourage viewers to help out with their own video pleas.